Hey guys, what’s going on!? Today we are going to be going over Lurn Insider. I’ve personally went through Lurn Insider and one of the top programs that I recommend when it comes to starting an online business. If you are here to see if you can make money online with this program then you have come to the right place. This program is going to teach you everything you need to get started. This is one of the places I’ve learned from when I started doing paid traffic to one of my businesses. So without further or do, let’s get into it! Lurn Insider is going to give 3 courses that’s going to help you change your life and build a passive online business. But first off who is Anik Singal? 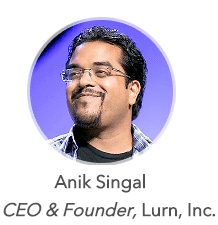 Anik Singal, the driving force behind Lurn Insider, is well known for generating over $10 million, but lost everything and became over $1.7 million in debt during the financial meltdown in 2007 & 2008. In a short span of 16 to 18 months, he went against all odds and managed to pay off all his debts, and built his company back to $10 million a year. That’s exactly what he is going to teach you in Lurn Insider. Lurn Insider Review – What Is Lurn Insider? Lurn Insider is a 3 part course that’s going to teach you 3 things. Course 1 is going to be Power Startup. Course 2 is going to be The Scaling Mind which is getting the right mindset for entrepreneurship. Finally, the 3rd course is going to be Profit Labs which is actually getting into the strategies. There’s so much value and content inside and a ton of it is video presentations. Anik Singal presents the video and teaches you on the inside multiple skills. Another person also comes on and teaches as well but I forgot his name. You get all of this and more! You get access to PDF files for Facebook Ads, Copywriting, Email Marketing, and SEO etc! The SAME SYSTEM that he used to build 5 companies that generate revenue on autopilot! Find Out More About Lurn Insider Here! The price to get started with Lurn Insider is a $5 donation to Africa. There is also the other method where there’s a different offer where you can pay just $1 to get 16 hours worth of training and top entrepreneurs featured such as Robert Kiyosaki, Bob Proctor and even the CEO of Clickbank! After the 21 days of training the price is $67 dollars a month. Lurn Insider Review – Who is Lurn Insider For? Lurn Insider is for intermediate entrepreneurs or entrepreneurs who have experience but brand new people who want to make money online can join this program as well and learn a lot of things in a few days! The hardest thing for new entrepreneurs is getting traffic, but since this course actually teaches you how to get traffic, I would say a brand new entrepreneur can learn alot from this. Plus it’s only $1 and $5 lol. Overall Lurn Insider is a great product for new entrepreneurs and struggling entrepreneurs online. Since it gives the exact system Anik Singal uses there’s no reason NOT to be in this program. Now if you can’t invest $1 or $5 into yourself to learn and become a true entrepreneur and get top notch training, you might as well leave this website and don’t look anywhere to make money online. You’re getting so much information, it’s literally a steal. But Like I said this is a great program because it teaches you exact system you need to do to start making money online. I teach the system as well in my YouTube Video Below. And YES I CUT MY HAIR! I WILL GROW IT BACK THOUGH!